Sulfuric acid just might be a bigger deal than you realize. It’s actually an international commodity chemical produced in large quantities all around the world. While sulfuric acid has primarily industrial uses, it’s also found in common household products such as drain cleaner and fertilizer. Here is some important information about sulfuric acid safety so you can be prepared when using this chemical, whether in the workplace or around the home. Sulfuric acid is a clear, colorless and odorless liquid. It is water-soluble and capable of causing serious damage, especially at when the chemical is at high-concentration levels. Historically known as oil of vitriol, sulfuric acid began to be produced on a large scale in the 18th century. Concentrated sulfuric acid is extremely corrosive and can cause serious burns when not handled properly. This chemical is unique because it not only causes chemical burns, but also secondary thermal burns as a result of dehydration. This dangerous chemical is capable of corroding skin, paper, metals, and even stone in some cases. If sulfuric acid makes direct contact with the eyes, it can cause permanent blindness. If ingested, this chemical may cause internal burns, irreversible organ damage, and possibly death. Exposure to sulfuric acid aerosols at high concentrations leads to severe eye and respiratory tract irritation and tissue damage. Consistent exposure to sulfuric acid aerosols, even at low concentrations, can cause a person’s teeth to erode. In laboratory or industrial settings, it’s important to use proper PPE when handling sulfuric acid. At home, you are most likely to encounter concentrated amounts of sulfuric acid when using an acidic drain cleaner. It’s important to follow the safety instructions on the drain cleaner label to avoid these serious hazards (possibly life-threatening) risks. It’s also a good idea to have access to an eye-flush station if using sulfuric acid at your workplace. Another important consideration when handling this dangerous chemical is that it can react violently if it comes into contact with water. 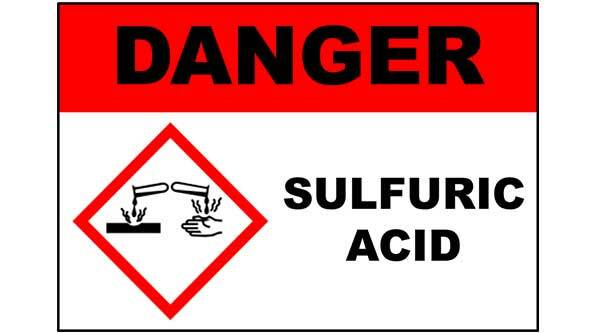 Exposure to sulfuric acid can occur as skin/bodily contact, ingestion, or inhalation of vapors. Each type of exposure can pose serious hazards to your health and should be managed immediately and appropriately by a medical professional to minimize damage and health risks. Skin Contact – If sulfuric acid comes into contact with your skin, immediately flush the affected area gently with lukewarm water for at least 30 uninterrupted minutes. Seek medical attention immediately. Eye Contact – If sulfuric acid gets into your eyes, immediately flush the eye(s) with water for at least 30 minutes. Seek medical attention immediately. Ingestion – If you ingest sulfuric acid, rinse your mouth immediately with water. Do not induce vomiting. Continually rinse your mouth with water and seek medical attention as soon as possible. Inhalation – If you inhale sulfuric acid aerosols, seek fresh air and medical attention immediately. Sulfuric acid or products that contain concentrated sulfuric acid should be stored in a cool, dry area away from direct sunlight and heat sources. Sulfuric acid should not be stored indoors in large quantities, to prevent the possible accumulation of vapors. Product containers should be regularly examined by professional MSDS experts for signs of damage or leaks. Whether you’re cleaning your drains at home or working with any concentration of this chemical at work, proper sulfuric acid safety is extremely important. For more information about sulfuric acid, safety, and disposal, search our database of MSDS information.